The PFLO-XPRO2 from Sunwayfoto is an aluminum, single piece L-bracket designed specifically for the Fujifilm X-Pro2 mirrorless camera. The plate enables fast changes between portrait and landscape orientation without the need to readjust your head and completely recompose the shot. You can simply release the bracket from your Arca-type quick release clamp or RRS lever clamp, tilt the camera 90°, and lock the bracket back in place. Using an L-bracket also facilitates a sturdier base of support than tilting an entire head to a 90° position. For enhanced safety the bracket features four safety stop screws, two on each axis, to prevent the bracket from accidentally sliding out of a loosened Arca-type clamp. It also includes an integrated strap loop for carrying your camera vertically and sensor centering lines - a priority feature for panoramic and virtual reality photographers. Two safety stop screws prevent the bracket from accidentally sliding out of a clamp while making adjustments. A slot on the bracket allows you to attach a strap. A convex edge design prevents the camera from twisting. Anodized surface provides improved abrasion and corrosion-resistance. Standard 1/4"-20 threaded mounting hole. Allows for access to data ports. Box Dimensions (LxWxH) 5.5 x 4.5 x 2.7"
PFLO-XPRO2 L-Bracket for Fujifilm X-Pro2 is rated 4.0 out of 5 by 3. Rated 5 out of 5 by Dave from Its perfect I had previously purchased a different and cheaper one that also had the extra grip. 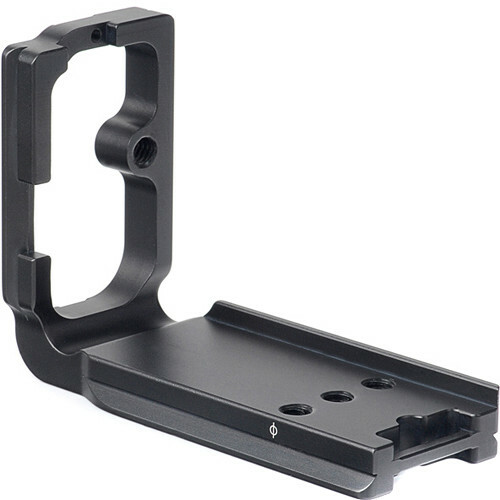 I found that I didnt want the grip but the place where it was attached was irritating to me and because this bracket does not have a grip making the baseplate that much smaller. Another small thing that some will appreciate are the centre lines on both the horizontal and vertical sides. Something anyone who does panoramas in a panorama rig will appreciate. Rated 5 out of 5 by Osman from Highly recommend this product Amazing quality. Perfect fit on the camera. Doesn't take away from the experience of shooting with the X-Pro2. Can this be used with the fuji hand grip? It looks as if one cannot use the usual remote. Also do you have access to the battery? No, it won't fit if the handgrip is installed. It doesn't block access to the battery, though.But mounting it vertically effectively blocks access to the ports used for cable releases! Both the mini-USB and the microphone ports.Technically, it doesn't block the ports themselves, but it doesn't allow clearance for the door that covers them to be open - so I can't mount it vertically on my RRS ballheads.This is really a shame, because it seems like a nice piece of gear otherwise, but the L part would have to extend about 1/4 further away from the side pf the camera to allow for vertical mounting, at least on RRS ballheads. Maybe it works fine on another brand? I don't know.But since the Fuji hand grip already enables mounting on my ballheads (just not vertically), I'm afraid this one is going back to B&amp;H.
Answered by: John W L.